The newest line at Taylor Coil Processing is a multiblank line, installed in 2003 after being refurbished with new controls by Herr-Voss Stamco. Shown here is the line’s leveler (top), installed on the entry end upstream from the slitting head; and the shear head (bottom). An air stacker downstream from the shear head stacks blanks onto pallets located underneath the line. own operational efficiencies, as well as investigating new options for providing services such as slitting, leveling, blanking, inspecting and packaging to help control costs throughout the supply chain. Taylor Coil Processing emphasizes to its workforce the urgency demanded throughout the supply chain for quick and accurate setups on its processing lines, to ensure on-time delivery to just-in-time customers even in the face of daily production-schedule reprioritizations. And, with value-added services such as full-coil top- and bottom-side inspection, and a keen eye for finding s to minimize packaging costs for customers, Taylor Coil Processing serves as a partner to all of the other links in its supply chain. “With inventories so restricted today,” says Pete Adamski, Taylor Coil Processing’s general sales manager, “we’re seeing more manufacturers spot-buying on the open market and sending coils to us for processing. We might inspect it, wash and re-oil it, slit the steel and cut it to length, so that the customer gets what it ordered. It might not be from the same source but it meets contract requirements. “We’re also seeing an increase in the number of small rush orders, as small as one coil,” Adamski continues. “Meeting short-run-time orders with one-day turnaround has created a greater emphasis on schedule-planning accuracy, and on how we operate our equipment. Where we used to have more opportunity to fine-tune our setups—setting slitting-arbor knives or threading the tension-leveler line—we now work to get our initial setups dead-on the first time. There’s not run-time availability left over to allow for starts and stops to readjust a setup.” Setup time on some equipment has been reduced by 30 percent in recent months, says Adamski. Taylor Coil Processing, primarily a supplier of light-gauge steel for exposed automotive applications, has shifted some of its focus to supplying other metal alloys for different end-use markets. Once 80 percent automotive-focused, the firm now processes 60 to 65 percent of its coils for automotive OEMs and Tier One suppliers, with growth coming in appliance and construction sectors. The firm’s 250,000-sq.-ft. plant, within earshot of the General Motors Lords-town assembly plant, houses four processing lines: a 72-in. slitting line with 0.120-in. thickness capacity that handles coils to 66,000 lb. ; a 72-in. tension-leveler line that includes a wash tank at the front end, 0.10-in. thickness capacity and the ability to handle coils to 66,000 lb. ; an inspection line that allows for manual top- and bottom-side inspection of as much as 10,000 tons/month; and, the latest addition, a 74-in. multiblanking line with thickness capacity to 0.120 in. and 60,000-lb. coil capacity. The multiblanking line joined the equipment lineup in 2003 when Taylor constructed a 118,000-sq.-ft. addition to the plant. It, along with the slitting and tension-leveler lines, was supplied by Herr-Voss Stamco, Callery, PA.
Adamski also notes the increased emphasis in the marketplace on the shape-correction capabilities of the firm’s tension-leveler line, whereas customers once flocked to the line for its ability to wash and dry coils, and then re-oil. As a value-added service to its neighborhood customer, Taylor Coil Processing provides a pallet-transfer service for custom blanks delivered to the GM Lordstown assembly plant. One of the OEM’s press lines accepts blanks on 5000-lb. 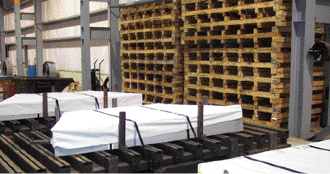 steel pallets (shown here), costly to transport to and from the plant. Instead, the supplier sends the blanks to Taylor on wooden pallets (shown stacked in the background), and Taylor transfers the blank stacks from the wood to the steel pallets for the very short and much more economical ½-mile trip to the GM plant. 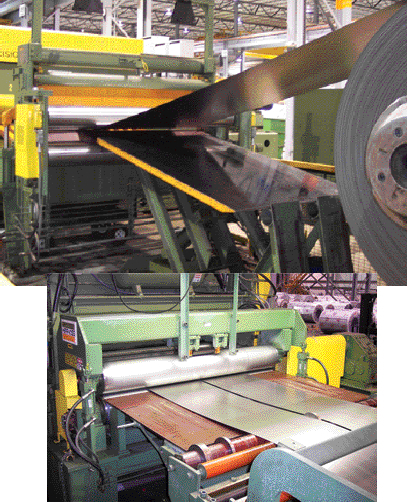 In 2005 the firm added an electrostatic oiler to the line, to improve its ability to deposit uniform, controlled coatings of oil or prelube on the coil stock. And, it recently switched to a new coating process used to refurbish the line’s bridle rolls, which has extended roll life from 9 to 15 months, translating into fewer outages for maintenance and increased line uptime. Rounding out its service offerings, Taylor has seen significant growth in work for its multiblanking line, primarily as local metalformers and service centers seek a more modern, accurate and cost-effective to replace their outdated blanking equipment. “We can provide a blanking service that is more cost-effective and that holds tighter dimensional tolerances,” says Adamski, “than the outdated blanking operations that many of the local companies run. We also in many cases can run larger coils and larger lot sizes, improving yield. Taylor offers its value-added two-sided inspection line as a means for stampers to avoid having to cut defects out of a coil before loading the coil onto a press line, which results in the use of smaller coils and, therefore, more time-consuming coil changes. Instead, operators manning the inspection line place vinyl flags on the coil stock as it feeds through the line to denote surface flaws. That allows the stamper/customer to run a full coil and, when noting the defect flag, simply pull the part with the flag out of the parts bin. In addition to helping customers improve yield, quality and JIT production efficiencies (via an online ordering system where customers can control delivery schedules to their liking), Adamski also explains how Taylor is helping customers reduce packaging costs. “Packaging offers significant opportunities to control costs throughout the supply chain,” he says. “For example, some local customers, for which we might transport coils only five to 10 miles, in the past would require the coils to be fully paper wrapped, and perhaps elaborately banded. We’ve worked with many customers to show them that, since more coils tend to be used upon receipt, following a JIT schedule, there’s not as much need for full paper wraps. We can more simply band the coils, and then apply a loosely fit paper shroud over the coils rather than a full wrap. Not only is this significantly less expensive on the front end, but it also is simpler and more cost-effective at the back end when the customer has to dispose of the packaging materials.